Born April 5, 1955 at Aichi in Japan. In 1947 he graduated in industrial design in a renowned school in Tokyo. In 1978 he took part in a competition for debutant cartoonists called by the magazine 'Weekly Shohen Jump'. For this occasion, he creates a short twenty-page pilot episode entitled 'Wonder Island' with which he wins the competition and the award for best debutant cartoonist. His story, published on the pages of the same weekly Shueisha, brings him glory and a ten-year contract with this famous publishing house. The same year the second part of the comic, 'Wonder Island 2', appears. After it's 'Dr. Slump and Arale' (1980) with which he has an unprecedented success and never tires the reader who, on the contrary, continues to always request new material signed by Akira. 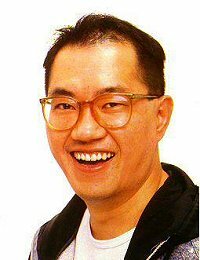 He later opened his own studio, Bird Studio, and also received one of his most successful products: Dragon Ball, which repeats the success of Arale and his companions. For more than 10 years Akira Toriyama has made drawings based on the sympathy of the stories, the characters and the simplicity of the drawing technique. The success of his works is also to be found in his ability as a screenwriter who makes the adventures of his characters never boring and always full of unexpected events.